This custom portable Skype client is built by a Portuguese programmer Felipe Daldegan. You can carry it on your portable hard drive, usb memory or any other portable device. The screenshot shows us that the client is in Portuguese but I don't know if it supports any other language. 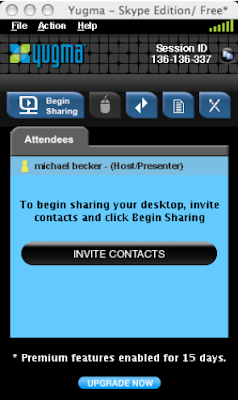 UVC is an online organizer and instant messaging suite. UVC will centralize all data so that shared tasks and calendars are possible between users. You can also use the audio/video module to have group conversations with your friends or co-workers. This module is capable of traversing most firewalls and works with all cameras supporting video for Windows. UVC consists of an address book, task management system, online scheduler, instant messenger, and video conferencing module. "This week marks the launch of Facebook Chat—a new way for you to communicate with your friends in real-time. The Wall and Inbox have been the primary ways to communicate, but when more immediacy is necessary—for example when making plans for lunch in half an hour or arguing over a foul call in the NCAA tournament—they might not be enough. Chat aims to fill this gap. We'll be rolling this out slowly going forward, but fairly soon you'll notice our new Chat bar at the bottom of your browser—no installation or assembly required. From this bar you can view your list of online friends and open conversations with any or all of them..."
Skype for your mobile is a beta version of Skype that you can download on to your mobile. You don’t need to switch operators or get a specialised phone. The software is free – although there might be a small data charge from your operator if you download it straight to your mobile. 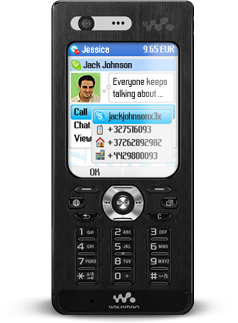 The java based mobile Skype client works on around 50 of the most popular Java-enabled mobile phones from Motorola, Nokia, Samsung and Sony Ericsson. * Works on almost 50 handsets, with a data plan. * Costs just a little to make and receive calls. * See when your contacts are online. * Instant message or call them using Skype. * Save on mobile calls to friends and family overseas. MSN Content Loader allows you enhance your chatting experience by adding numerous emoticons or winks. You can add some MSN objects such as winks, mcos, emoticons, backgrounds, smileys to your Windows Live Messenger using this tool easily. MSC Messenger is an instant messaging application that allows you to chat with friends. MSC Messenger has features like webcam and voice chat. You can use MSC with your friends and build your own network if you are not a fan of other popular IM clients like Windows Live Messenger or Yahoo Messenger. "Last week, Flickr.com announced its new video feature, allowing Flickr Pro users to upload videos and share them online alongside their photos. As a result, we added support for Flickr videos to the inline media player in Yahoo! Messenger 9.0 Beta. 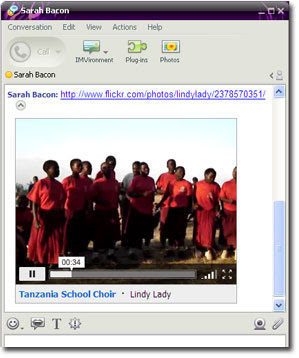 If you share a Flickr video link or a friend shares one with you, you can watch the video right in the IM window..."
MSN E-Fix (Italian) designed to help fix the most common errors on MSN and Windows Live Messenger. You can easily select error names from the list and click one button to fix them. MSN Repair 2 (Italian) is a small utility developed by the Italian developer Valentino Marangi. It fixes problems and common errors in Windows Live Messenger and MSN Messenger. The user interface of MSN Repair is very simple. By clicking a single button you can fix 13 common errors in registry settings, program libraries and files that have been altered since installation of MSN Messenger or Windows Live Messenger. fring is a mobile internet service & community that enables you to access with your social networks on-the-go, make free calls and live chat with all your fring, Skype, MSN Messenger, Google Talk, ICQ, SIP, Twitter, Yahoo and AIM friends using your handset's internet connection rather than costly cellular airtime minutes. A preview version of fring is now available for use on the iPhone. fring for iPhone allows you talk, chat and interact with other fring users and all of their online communities, using iPhone's WiFi connection. The Gilly Messenger application was designed to be a light version of Windows Live Messenger. Gilly Messenger has simple user interface like MSN Messenger 5 but has alot of useful features including Scripting capability, Remote Control, Chat Bot, Auto Message, Ignore contact etc. · Talk to people while they're blocked. · Keep talking to people even after appear offline. · Keep talking to people even after signing out. · Open multi instances of GM. · Search your contact list. · Text Styler (Word/Character replacement tool). · IM Window commands e.g cls, /block/ ignore e.t.c. · New idle state (If GM is not used for 5 mins it will change your status to idle). · New ignore option (Prevents people from sending you message). · Easy to change nick and status. · Choose status before signing-in. · Store comments on contacts. · Contact renaming (Custom Nick). · Have a fake nick in conversation. · MSN Messenger like interface. · Get to know when someone opens your window. · Get to know when someone closes yoru window. · Contact statistics (last online time, last message time, last file transfer ip, e.t.c.). · Change file transfer port to bypass firewalls (Does not work from MSN to GM). · Store password for multiple accounts. · GM Display Pics (Only viewable to GM users). · GM Remote Control (Control your PC using a command line interface through text messages). NOTE: Gilly Messenger comes with an optional Gilly Messenger Toolbar that you can install to block popups, search from your address bar or get lowest prices when you shop online. 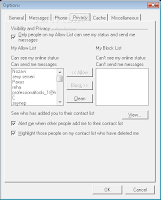 Minicontacts for Windows Live Messenger allows you view your contacts in a 'low-res' contact list. 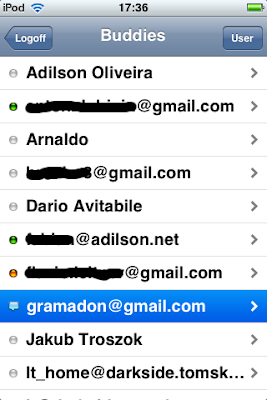 It comes with a search feature and ability to replace the original contact list (set in preferences). - Click on the Messenger Plus! Scripts logo in your contact list. - Click on MiniContacts and choose one of the options. Hello is a new tool from Picasa that allows you instantly send your pictures to your friends and talk about them. When you use Hello, you get to see your photographs together with your friends online. You don’t have to wait for huge email attachments to download or upload your pictures to a public website. Just point at a picture and you can tell the person who sent it exactly what you think. With just one click, you can get the original high-quality, full-sized file to print. When you use Hello and Picasa together, your received images will instantly appear in your Picasa folders. 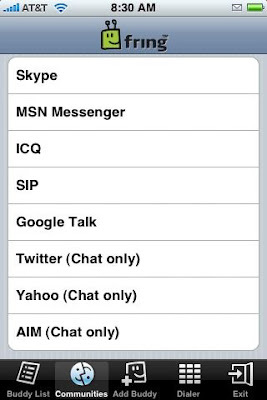 iChabber is a Gtalk/Jabber client with simple user interface for the iPod Touch and iPhone. iChabber runs in the background allowing you to be in the loop as long as you stay logged in. Please note that iChabber is currently in alpha stages and there are some bugs. 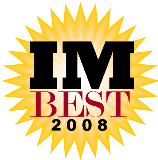 "In March 2008, we asked our readers to nominate their favorite instant messengers in six categories for our first ever IM Best Awards, a celebration of the best in the IM industry. After an overwhelming response, the nominations have finally been tabulated and the results are in! In addition to a number of veteran instant messengers, this year’s list features many third-party clients, one even sweeping five out of six categories with six total nominations..."
Youtube Info is a Messenger Plus! Live script which allows you retrieve Youtube link's titles, check your Youtube account for new events, download Youtube videos. -Check your Youtube account for new friend invites, messages, and received videos. -Opens a url in a compact window so you don't have to go to Youtube to directly watch the video. Yugma is the easy free team collaboration tool. Yugma Team Collaboration for Skype plugin lets you connect with up to 10 other people for free. You can upgrade any time to host meetings with up to 500 other people. Typical uses include collaboration with offsite team members, virtual presentations, webinars, streamline workflow, remote tech support, customer service, elearning, study groups, tutoring sessions, and much more. "This evening I decided to play with a really kewl new app called Fluid. What this app does is allow you to create Site Specific Browsers. One of the first usages which popped into mind was a product I helped develop, Yahoo! Web Messenger. An annoyance of mine with it is that it had to live in a browser tab, something prone to getting closed accidentally, and also didn’t have any decent notifications of new messages when not in focus. Being the perfect candidate for Fluid, IMHO, I set out to give it a shot. In less than an hours time I built a pretty kewl demo and here’s how you can use it too. Read on for a howto and example video..."
"We’ve received word that Facebook has released its much anticipated chat/IM application to a few unspecified networks. The “pre-launch beta”, as Facebook is calling it, started sometime last night. The only thing new that we’ve learned is that Facebook Chat will incorporate mini-feed stories into IM conversations. If you’re chatting with someone and they do something to your profile, like post a message on your wall, you will get a notification into your chat window with them..."
Wall-E is a new animation movie by Disney and Pixar which features a robot named Wall-E. This skin is based on the Wall-E movie and comes with a series of settings to make your Messenger experience more unique. 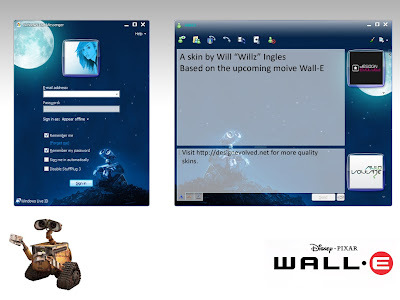 Wall-E Skin requires Messenger Plus! Live plugin to use. Google Talk Labs Edition is an experimental version of the Gtalk client. It has many of the same features as the Google Talk Gadget, including instant messaging, emoticons, and group chat. Some features like voice calling and file transfer from the Google Talk client did not make it into this version. Google Talk Labs Edition also comes with new desktop notifications from Calendar, Orkut, and Gmail. Currently, Google Talk Labs Edition is only available for Windows PCs. "...In honor of Earth Day (3 weeks from today: April 22, 2008), on that day our Google Talk servers will start automatically sending your conversations using IM-speak instead of normal words. But you can help save some computing power (and more wasted energy!) by shortening your conversations yourself. We know you'll all want to practice your IM-speak, so we're helping by introducing a new translation bot, en2im@bot.talk.google.com, which will translate your conversations into IM-speak, to help you get used to the new lingo. AFAIC, U can gve me the 20 $$ YOM whn I CUL8R." Google Translator is a Messenger Plus! Live script which allows you simply translate what you wrote in your chat window when you press the F5 key. 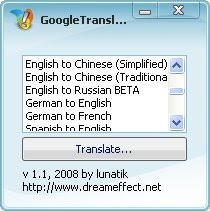 You can translate in every language available at Google Translation services page. You need to install Messenger Plus! Live plugin in order to use Google Translator script.